Hello beautiful people! Can you believe thanksgiving it already here and the following week is December--I smell Christmas. Has anyone started their Christmas shopping yet? I haven't started and I don't anticipate starting until school is over in less than three weeks; but I have been compiling my list. On another note, my weekend seem pretty short. As usual, I spent most of my Saturday in the library. On Sunday after church, I went out with about fifteen friends for another surprise dinner planned for a friend at Cheesecake factory. Before we went for dinner with friends, I had to make my favorite okra soup. I ate so much of the soup that I could barely eat when I got to Cheesecake; so, I had some quesadilla with Strawberry daiquiri--fun night indeed! You look good in blue and red. Love your outfit posts. Looking absolutely fabulous doll. Love those pants just gorgeous on you. You look gorgeous,as always!Love the pants! Stella, you really'classy'. Amazing style!!!!!!!! 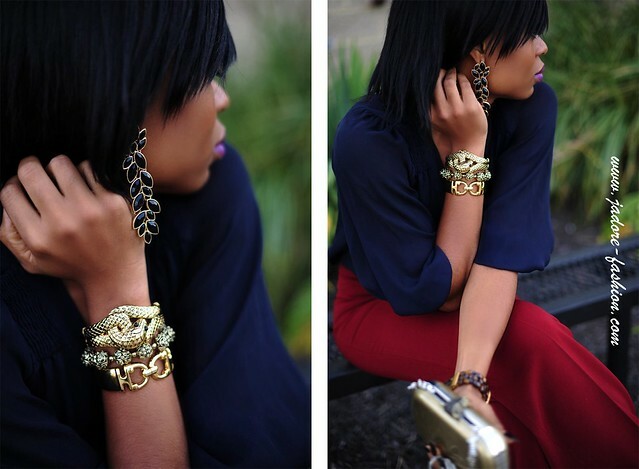 Love the outfit especially the jewelry! totally love your bracelets, i'm inspired! love your jewellery doll! Cant wait or christmass! Classic outfit...Blue and red is a perfect contrast. I simply love all your accessories. I am a big Michael Kors fan too. 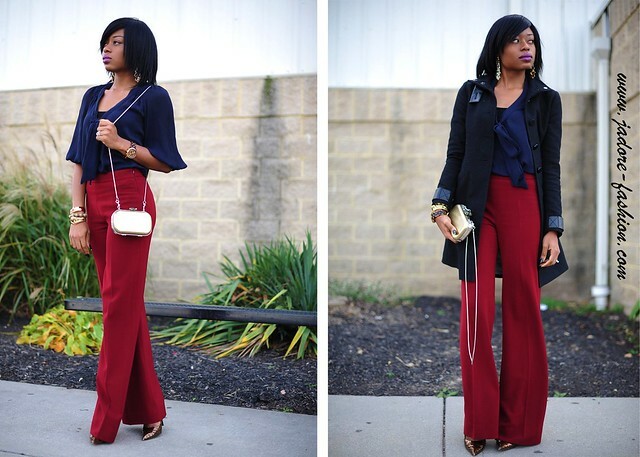 The navy and red combo looks wonderful on you. This is such a classic silhouette and you wear it well. I was most struck by your snack bracelet, I can't believe you found it at Macys! Get it Girl!! always fab! 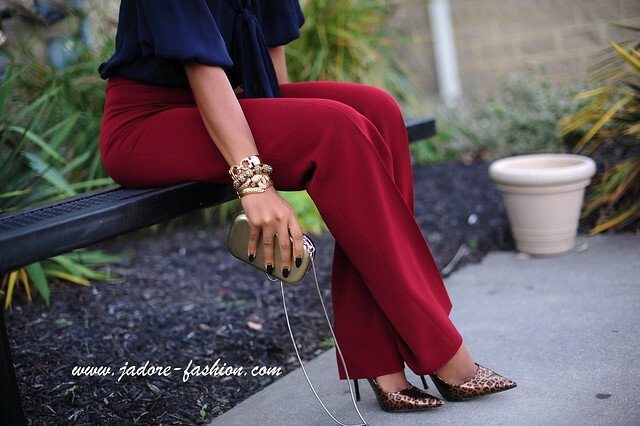 These red pants are beyond perfection. I definitely need a pair of my own. P.S. Cheesecake Factory = LOVE. you look awesome. love the wrist candy! Foremost, this color combo is awesome. Love the navy and deep red. Those pants are constructed really well I need to try those out ASAP ;-) Last, those heels really set off this look. I'm so in love with animal print right now. Super fab ensemble! Seriously Thanksgiving came out of NOWHERE this year!!!! I love the shade of your lipstick, goes great with this outfit! I am NOT ready for the holidays. at all, but excited nonetheless. Love our look and your arm candy!! Gorgeous! Those pants are fab! Love the clutch and the rest of the accessories. i love the outfit and the photos! I love the red and blue. It looks so rich and vibrant together. You look beautiful! You look amazing! Your style is something else, your photographer is something else. Toh Bahd!!! Amazing pants! I am following you now! Hope you follow me too! You look so pretty, as usual. I love that lipstick on you.. I would love to have a Michael Khors watch.. just a nice watch period. lol..
Love the high waist pants. Gorgeous bracelets. I love your jewelry! I'm also jealous that you can pull off 'Stiletto Nails.' I wish I could. 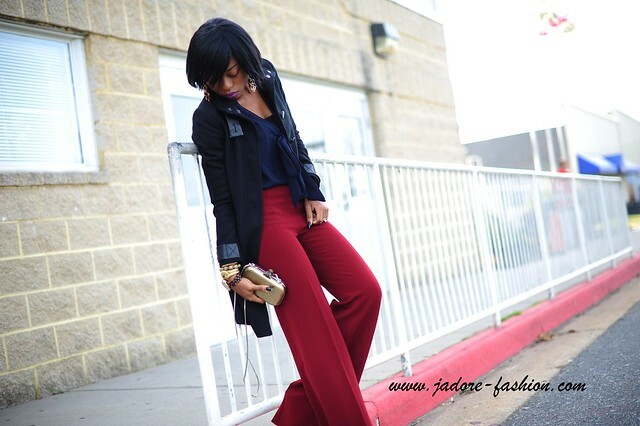 Love the high waist pants.